Background and Aims: During the long-term treatment of patients with hereditary haemochromatosis (HH) the authors observed that proton pump inhibitors (PPI) reduced the requirement for maintenance phlebotomy. Gastric acid plays a crucial role in non-haem iron absorption and the authors performed a case review and intervention study to investigate if PPI-induced suppression of gastric acid would reduce dietary iron absorption in C282Y homozygous patients. Methods: Phlebotomy requirements to keep serum ferritin ∼50 μg/l before (mean 6.1 (SE 0.6) years) and during (3.8 (0.9) years) administration of a PPI were evaluated in seven patients and a post-prandial study was performed to determine whether PPIs reduce absorption of non-haem iron (14.5 mg) from a test meal in a further 14 phlebotomised patients with normal iron stores. Results: There was a significant reduction (p<0.001) in the volume of blood removed annually before (2.5 (0.25) l) and while taking (0.5 (0.25) l) a PPI. Administration of a PPI for 7d suppressed absorption of non-haem iron from the meal as shown by a significant reduction (all p<0.01) in: area under the serum curve (2145 (374) versus 1059 (219)), % recovery of administered iron at peak serum iron (20.5 (3.2) versus 11.0 (2.0)%) and peak serum iron (13.6 (2.4) vs 6.1 (1.2) µmol/l) (all values are before vs during PPI). Conclusions: Administration of a PPI to patients with HH can inhibit the absorption of non-haem iron from a test meal and the habitual diet. Other methods of preventing or reducing the rate of iron re-accumulation in HH are not routinely practised even though dietary intervention appears to have the potential to limit dietary iron absorption. For example, polyphenols supplied by drinking tea resulted in a 70% reduction in the absorption of non-haem iron from a test meal in a group of HH patients.10 Gastric acid production is also known to be an important factor in ensuring optimum conditions for the absorption of non-haem iron11 and in a recent case report, two anaemic patients failed to respond to oral iron treatment while taking proton pump inhibitor (PPI) but iron status improved when the PPI was withdrawn.12 In an early study, it was reported that a single dose of cimetidine, an H2-histamine receptor antagonist (H2RA), resulted in a significant reduction in the absorption of non-haem iron from a test meal in controls and patients with idiopathic haemochromatosis.13 However, there are reasons to revisit this issue. Firstly, the impact that suppression of gastric acid has on the absorption of non-haem iron has not been assessed in HH patients homozygous for the C282Y mutation. Secondly, despite their widespread use long-term pharmacological suppression of gastric acid with PPIs is not associated with an increased risk of iron deficiency anaemia,14,15 possibly because individuals with normal regulatory mechanisms governing iron absorption are able to adapt to reduced bioavailability of non-haem iron by upregulating absorption. Thirdly, PPIs offer a greater degree of acid suppression than H2RA and are widely used in the treatment of acid-peptic disease in primary care. The present study was prompted by our observation that patients taking a PPI or H2RA had a reduced requirement for maintenance phlebotomy. A case review of patients with haemochromatosis undergoing maintenance phlebotomy at this institution was conducted to evaluate the potential effect of these agents on iron re-accumulation. A comparison of paired data was made in a group of patients where phlebotomy records were available for a substantial period when no acid suppressant agents were taken, and then, during a subsequent period following administration of a PPI. A further group of patients who had never taken a PPI was also studied. The case review was followed by an intervention study of post-prandial iron absorption in fully treated patients with HH before and during administration of a PPI to look for evidence that these agents reduce the absorption of dietary non-haem iron. These studies were approved by the Local Research Ethics Committee of King’s College Hospital and patients gave their informed consent. Clinical records of 15 patients who were homozygous for the C282Y mutation in HFE and attending the Institute of Liver Studies, King’s College Hospital, London were reviewed. In a study of seven patients, a paired design was used to compare phlebotomy treatment before and during administration of a PPI, when this had been administered for at least 12 months. These seven patients represent all those identified and, specifically, no patients who met these criteria were excluded from the analysis. A further eight patients who had never taken a PPI acted as case controls in an unpaired analysis. Of the seven patients in the paired analysis, five had undergone liver biopsy (fibrosis, 3; cirrhosis, 2) while in the unpaired group, six had undergone liver biopsy (fibrosis, 3; cirrhosis, 3). All liver biopsies showed grade 4 siderosis.16 All patients had been fully treated and were undergoing maintenance phlebotomy of 600 ml per session performed at a frequency to maintain serum ferritin ∼50 μg/l.8,9 Review was routinely conducted at three-monthly intervals and the serum ferritin and haemoglobin concentration from the previous visit used to inform the decision to carry out phlebotomy. An increase or decrease in the frequency with which phlebotomy was performed was determined by the corresponding change in serial serum ferritin values compared to the target level of 50 µg/l. The iron burden at diagnosis was calculated by assuming that 600 ml whole blood contains ∼0.25 g iron and noting the volume of blood removed by the initial course of phlebotomy leading to a reduction in serum ferritin to ∼50 µg/l and a transient fall in haemoglobin to between 12 and 13 g/dl. The long-term use of non-steroidal anti-inflammatory drugs (NSAIDs) was noted. Serum ferritin was measured by immunoassay with chemiluminescent sensing on core equipment (Advia Centaur; Bayer Diagnostics, Newbury, UK) in the Department of Clinical Biochemistry, King’s College Hospital. Statistical analyses were carried out using SPSS, Version 10 for Windows (SPSS Inc, Chicago, IL, USA). The paired Student’s t test was used for a within-group comparison of: (1) the number of years used to assess quantity of blood removed before versus during administration of a PPI; (2) average serum ferritin and haemoglobin levels over the course of both recording periods; (3) quantity of blood removed annually to maintain serum ferritin ∼50 µg/l during both recording periods. Comparison of these parameters between paired and unpaired groups was performed using one-way ANOVA and an unpaired t test used to compare mean age at the time of analysis. Fourteen patients who were homozygous for the C282Y mutation in HFE and undergoing maintenance phlebotomy took part in a study of the effect of a PPI on the absorption of dietary non-haem iron. Mean age at the time of the study was 57.1 (SE 3.1) years and mean length of time since diagnosis was 8.7 (SE 2.1) years. Liver biopsy performed at diagnosis showed grade 4 siderosis16 with fibrosis (n = 10) or cirrhosis (n = 4) and the iron burden calculated as described above was 12.8 (SE 1.8) g. Serum ferritin and haemoglobin concentration at the time of study were 87.8 (SE 14.1) µg/l and 13.8 (SE 0.4) g/dl respectively. The patients received one of two PPIs, at pharmaco-equivalent doses, namely lansoprazole (30 mg) or omeprazole (20 mg) daily. Both PPIs increase intragastric pH to a similar degree and duration over a 24 h period.19 PPIs were taken in the morning for 7 days, starting on the day after the first iron absorption test with the final dose taken on the morning of the second iron absorption test. Following ingestion of the meal patients were allowed to consume only water for a period of 4 h. During this time, blood was taken every 30 min for measurement of total serum iron on a Cobas Mira autoanalyzer using a ferrozine-based colorimetric assay20 with absorption measured at 562 nm. The parameters of the serum iron curves used as indicators of iron absorption were: the area under the serum iron curve for 4 h (AUC0–4) calculated using the trapezium rule, the maximum increase in serum iron concentration (Δ iron max) and percentage iron recovered at peak (max).17 A repeated-measures ANOVA was used to compare the post-prandial increase in total serum iron in patients before and during administration of the PPI using SPSS version 10. In the first study, paired data were employed to minimise factors other than a PPI that could have influenced iron stores. Records of blood removed from seven patients during maintenance phlebotomy over an extended period, on average ∼10 years, were available for evaluation, together with repeated haematological and iron biochemical indices. The length of the two recording periods—before and during administration of a PPI—did not differ significantly (table 1, paired group). In addition, haemoglobin concentration and serum ferritin levels before and during administration of a PPI did not differ significantly (table 1) indicating that there was no substantial change in iron stores over the two periods evaluated. The patients were heavily iron loaded at diagnosis as indicated by marked iron overload on liver biopsy (grade 4 siderosis) and the removal of 14.3 (SEM 5.1) g of iron by the initial course of phlebotomy and it can be anticipated that such patients would require the annual removal of ∼4 units of blood (2–2.5 l) per year to prevent re-accumulation of iron stores.8,9 Annual phlebotomy requirements were found to be 2.5 (SEM 0.25) l in the period before administration of a PPI (fig 1) while administration of a PPI over a ∼4-year period (tables 1 and 2) resulted in a significant reduction in the amount of blood removed annually (0.5 (SEM 0.25) l, p <0.001) in order to maintain ferritin levels close to the target level of ∼50 µg/l (fig 1). The rationale for the administration of a PPI is summarised in table 2. Bar chart showing that the quantity of blood removed annually to maintain serum ferritin at ∼50 μg/l in patients with HH before (filled bar) and during administration of a PPI (open bar) was significantly different (p<0.001). Values are mean (SEM), n = 7. The recording periods “before” and “during administration” of a PPI were 6.1 (SEM 0.6) years and 3.8 (SEM 0.9) years respectively. In all patients a PPI was administered following upper gastrointestinal endoscopy that was performed because of the development of a new symptom of epigastric pain. Histologically proven Barrett’s oesophagus was demonstrated in two patients (1 and 4) while changes of mild to moderate reflux oesophagitis were found in the remaining patients. This was associated with long-term NSAID use in patients 3 and 7 that was continued while taking a PPI. In all patients upper gastrointestinal endoscopy excluded possible sources of haemorrhage from the oesophagus, stomach and duodenum including varices, portal hypertensive gastropathy and peptic ulceration. As well as using paired data to investigate the effect of a PPI on iron stores, the records of eight case control patients who had never taken a PPI were also analysed. This unpaired group did not differ significantly when compared with the paired group in terms of mean age (years (SEM)) at time of analysis (55.8 (4.9) vs 63.6 (5.0) (paired), p = 0.29) or initial iron burden (15.9 (3.9) vs 14.3 (5.1) g (paired), p = 1.0). In addition, the length of the recording period, haemoglobin concentration and serum ferritin level (μg/l) did not differ significantly when compared with the paired group, either before or during a PPI (table 1). Annual phlebotomy requirements for the unpaired group compared with the paired group before PPI did not differ significantly, while, as expected, there was a highly significant reduction when compared with the paired group during PPI (table 1). It is unlikely that increased age played a part in this reduction, because the mean age of the paired group while on the PPI did not differ significantly from the unpaired group and yet phlebotomy requirements were significantly reduced (table 1). Fourteen fully treated patients took part in an investigation of the effect of a PPI on iron absorption. Serum iron curves were generated on two occasions following ingestion of a meal containing highly bioavailable non-haem iron, the first before taking a PPI and the second a week later, having taken a PPI for 7 days. 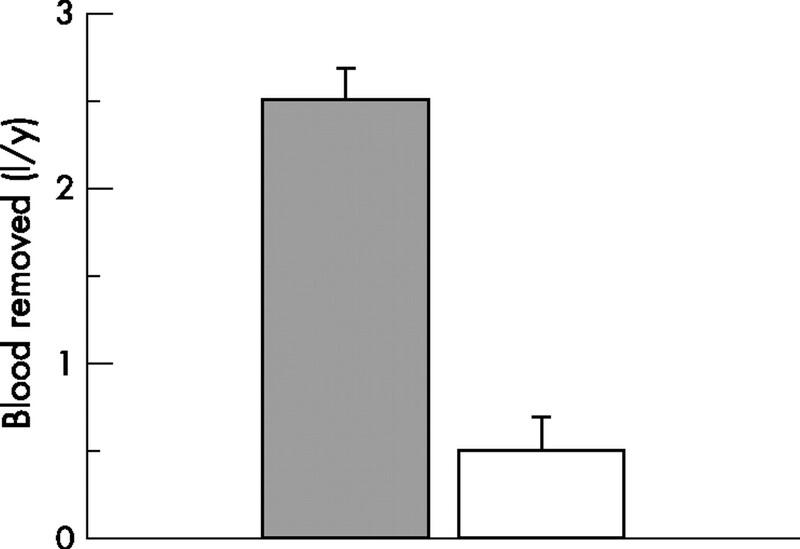 As shown in figure 2 the presence of a PPI resulted in a significant reduction (p<0.01) in the maximum increase in serum iron concentration (Δ iron max) following ingestion of the meal. Administration of a PPI led to a significant reduction (p<0.01) in other parameters, namely the area under the serum iron curve for 4 h (AUC0–4) and % recovery of administered iron at peak (max), that were derived from the serum iron curves and used as indicators of iron absorption (table 3). Serum iron curves were generated following ingestion of a meal containing non-haem iron (14.5 mg) before (closed squares) and at the end of a 7 d course of a PPI (open squares). Values are means (SEM), n = 14. PPI resulted in a significant reduction (all p<0·01) in (i) maximum increase in serum iron concentration (Δ iron max), (ii) area under the serum iron curve over 4 h (AUC0–4), and (iii) percentage of administered iron recovered at peak (max). Our investigations suggest that administration of a PPI to patients with HH can inhibit absorption of dietary non-haem iron, and limit the accumulation of iron in tissue stores. The advantage of measuring serum iron increase after ingestion of oral iron is that it directly addresses the issue of iron absorption rather than erythrocyte use as shown by most isotope-based techniques (see reference 17 for discussion). We have demonstrated a significant PPI-related reduction in the absorption of non-haem iron in patients with HH, and this, together with our observation that there was a significant reduction in phlebotomy requirements in patients taking PPIs over a long period, suggests that gastric acid suppression can inhibit the absorption of non-haem iron from the habitual diet in HH. Iron absorption consists of an uptake step in which iron is transported across the apical membrane of the enterocyte, and transfer, the movement of iron across the basolateral membrane into the portal circulation.21 The apical and basolateral transporters have recently been identified as divalent metal transporter 1 (DMT1) and ferroportin respectively, (reviewed in Pietrangelo1 and Bomford2) and, furthermore, the duodenal expression of both carriers is increased in HH.27–29 The increase in ferroportin expression is caused by a relative lack of the iron regulatory hormone hepcidin, a peptide that regulates cellular iron efflux by binding to ferroportin and inducing its internalisation.30 Hepcidin is deficient in both treated and untreated HH,31,32 resulting in uncontrolled activity of ferroportin and increased efflux of iron from the enterocyte. While low levels of intracellular iron in the enterocyte could result in increased expression of the apical transporter, by stabilising mRNA transcripts through enhanced binding of iron-responsive protein to the 3′ iron-responsive element, this is not known with certainty.27 In spite of the increased activity and expression of iron transporters and the powerful stimulus to iron absorption provided by phlebotomy,33 iron absorption and tissue iron accumulation can be significantly reduced by administration of a PPI. This contrasts with tea drinking which significantly inhibits iron absorption from a test meal but has only a modest effect on phlebotomy requirements needed to maintain normal iron balance.10 PPIs, being powerful inhibitors of gastric acid, disrupt the speciation of dietary iron and this may be a more effective way of inhibiting non-haem iron absorption than by binding luminal iron with polyphenols present in tea. Long-term use of PPIs has not been reported to compromise iron status in normal subjects,14,15 possibly because individuals with intact regulatory mechanisms of iron absorption are able to adapt to impaired bioavailablity of non-haem iron. One interpretation of our results is that such adaptation does not occur in HH. These patients demonstrate an expression profile of mucosal iron transporters27 and iron absorption kinetics more in common with iron deplete than with iron replete individuals,34–36 and, as a result may not be able to further increase iron absorption. Nevertheless, our finding that patients with HH who were taking a PPI still required the removal of 0.5 (0.2) l of blood annually to maintain normal iron balance suggests that an additional source of iron was available in the habitual diet. We would argue that this was likely to be haem iron because absorption of this form of iron is not dependent on gastric HCl34,37 and, furthermore, is increased in haemochromatosis.34 It is also possible that absorption of haem iron plays an important role in ensuring dietary iron availability in normal subjects on a long-term PPI. Further investigation of this question would be possible using the study design described here. We thank Kelly Gleason and Wendy Williams for their help with the iron absorption studies and staff in the department of Clinical Biochemistry, King’s College Hospital for analysing total serum iron. Pietrangelo A. Hereditary hemochromatosis: a new look at an old disease. N Engl J Med2004;350:2383–97. Bomford A. Genetics of haemochromatosis. Lancet2002;360:1673–81. Davis W DJr, Arrowsmith W R. The effect of repeated phlebotomies in hemochromatosis; report of three cases. J Lab Clin Med1952;39:526–32. Powell L W. Changing concepts in haemochromatosis. Postgrad Med J1970;46:200–9. Bomford A, Williams R. Long term results of venesection therapy in idiopathic haemochromatosis. Q J Med1976;45:611–23. Niederau C, Fischer R, Purschel A, et al. Long-term survival in patients with hereditary hemochromatosis. Gastroenterology1996;110:1107–19. Niederau C, Fischer R, Sonnenberg A, et al. Survival and causes of death in cirrhotic and non-cirrhotic patients with primary hemochromatosis. N Engl J Med1985;313:1256–62. Tavill A S, American Association for the Study of Liver Diseases, American College of Gastroenterology, American Gastroenterological Association. Diagnosis and management of hemochromatosis. Hepatology2001;33:1321–8. Dooley J, Worwood M. Guidelines on diagnosis and therapy: genetic haemochromatosis. British Committee for Standards in Haematology 2000:1–33. Kaltwasser J P, Werner E, Schalk K, et al. Clinical trial on the effect of regular tea drinking on iron accumulation in genetic haemochromatosis. Gut1998;43:699–704. Champagne E T. Low gastric hydrochloric acid secretion and mineral bioavailability. Adv Exp Med Biol1989;249:173–84. Sharma V R, Brannon M A, Carloss E A. Effect of omeprazole on oral iron replacement in patients with iron deficiency anemia. South Med J2004;97:887–9. Skikne B S, Lynch S R, Cook J D. Role of gastric acid in food iron absorption. Gastroenterology1981;81:1068–71. Koop H, Bachem M G. Serum iron, ferritin, and vitamin B12 during prolonged omeprazole therapy. J Clin Gastroenterol1992;14:288–92. Stewart C A, Termanini B, Sutliff V E, et al. Iron absorption in patients with Zollinger-Ellison syndrome treated with long-term gastric antisecretory therapy. Aliment Pharmacol Ther1998;12:83–98. Scheuer P J, Williams R, Muir A R. Hepatic pathology in relatives of patients with haemochromatosis. J Pathol Bacteriol1962;84:53–64. Conway R E, Geissler C A, Hider R C, et al. Serum iron curves can be used to estimate dietary iron bioavailability in humans. J Nutr2006;136:1910–14. Holland B, Welch A A, Unwin I D, et al.McCance and Widdowson’sThe composition of foods. Fifth edition. London: The Royal Society of Chemistry and Ministry of Agriculture, Fisheries and Foods, 1991. Miner P Jr, Katz P O, Chen Y, et al. Gastric acid control with esomeprazole, lansoprazole, omeprazole, pantoprazole, and rabeprazole: a five-way crossover study. Am J Gastroenterol2003;98:2616–20. Ruutu R. Determination of iron and unsaturated iron binding capacity in serum with ferrozine. Clinica chimica acta1975;61:229–32. Miret S, Simpson R J, McKie A T. Physiology and molecular biology of dietary iron absorption. Annu Rev Nutr2003;23:283–301. 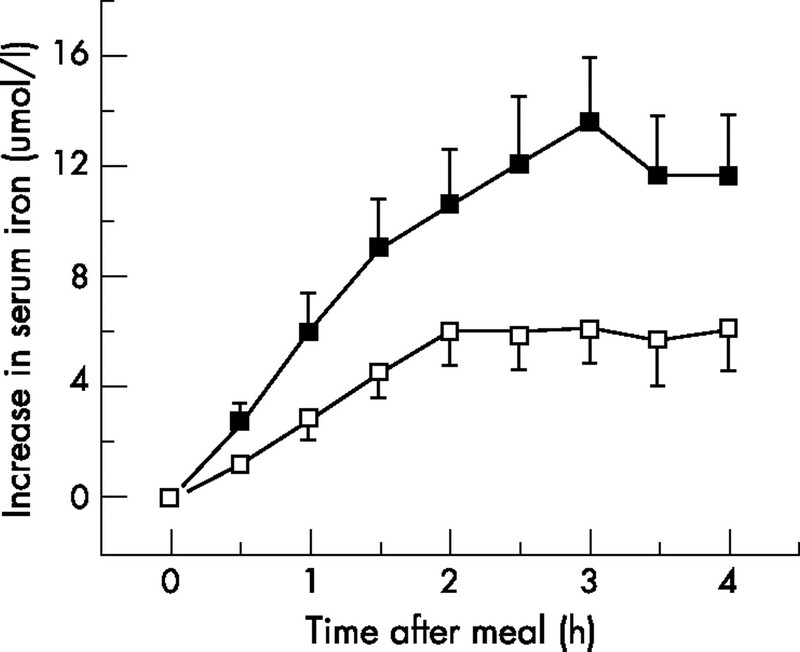 Hallberg L. Bioavailability of dietary iron in man. Annu Rev Nutr1981;1:123–47. Bezwoda W, Charlton R, Bothwell T, et al. The importance of gastric hydrochloric acid in the absorption of nonheme food iron. J Lab Clin Med1978;92:108–16. Lind T, Rydberg L, Kyleback A, et al. Esomeprazole provides improved acid control vs. omeprazole in patients with symptoms of gastro-oesophageal reflux disease. Aliment Pharmacol Ther2000;14:861–7. Archambault A P, Rovelstad R A, Carlson H C. In situ pH of duodenal bulb contents in normal and duodenal ulcer subjects. Gastroenterology1967;52:940–7. Schade S G, Cohen R J, Conrad M E. Effect of hydrochloric acid on iron absorption. N Engl J Med1968;279:672–4. Zoller H, Koch R O, Theurl T, et al. Expression of the duodenal iron transporters divalent-metal transporter 1 and ferroportin 1 in iron deficiency and iron overload. Gastroenterology2001;120:1412–19. Griffiths W J, Sly W S, Cox T M. Intestinal iron uptake determined by divalent metal transporter is enhanced in HFE-deficient mice with hemochromatosis. Gastroenterology2001;120:1420–9. Stuart K A, Anderson G J, Frazer D M, et al. Duodenal expression of iron transport molecules in untreated haemochromatosis subjects. Gut2003;52:953–9. Nemeth E, Tuttle M S, Powelson J, et al. Hepcidin regulates cellular iron efflux by binding to ferroportin and inducing its internalization. Science2004;306:2090–3. Bridle K R, Frazer D M, Wilkins S J, et al. Disrupted hepcidin regulation in HFE-related haemochromatosis and the liver as a regulator of body iron homoeostasis. Lancet2003;361:669–73. Gehrke S G, Kulaksiz H, Herrmann T, et al. Expression of hepcidin in hereditary hemochromatosis: evidence for a regulation in response to serum transferrin saturation and non-transferrin-bound iron. Blood2003;102:371–6. Williams R, Manenti F, Williams H S, et al. Iron absorption in idiopathic haemochromatosis before, during, and after venesection therapy. BMJ1966;2:78–81. Lynch S R, Skikne B S, Cook J D. Food iron absorption in idiopathic hemochromatosis. Blood1989;74:2187–93. Powell L W, Campbell C B, Wilson E. Intestinal mucosal uptake of iron and iron retention in idiopathic haemochromatosis as evidence for a mucosal abnormality. Gut1970;11:727–31. Marx J J M. Mucosal uptake, mucosal transfer and retention of iron, measured by whole-body counting. Scand J Haematol1979;23:293–302. Turnbull A, Cleton F, Finch C A. Iron absorption. IV. The absorption of hemoglobin iron. J Clin Invest1962;41:1897–07. Seamark C J, Hutchinson M. Controversy in primary care: should asymptomatic haemochromatosis be treated? BMJ2000;320:1314–17. Hicken B L, Tucker D C, Barton J C. Patient compliance with phlebotomy therapy for iron overload associated with hemochromatosis. Am J Gastroenterol2003;98:2072–7. Porter J B. Practical management of iron overload. Br J Haematol2001;115:239–52.